The economy is still stuck in slo-mo mode: it's been the weakest recovery ever for the past seven years: a mere 2.1% annualized. The first half of this year was even weaker than that (1%), but it's the nature of GDP numbers to be volatile; as with the payroll employment data, you have to look at the trends over months and years to get an approximate idea as to what is going on. Monthly, quarterly, and annual data are routinely revised after the fact, and sometimes significantly. It's amazing that the government statisticians can even come close to measuring all the activity inside an $18 trillion economy. The data we can trust, however—tax receipts, market-based prices, corporate profits, unemployment claims—are in general agreement with the GDP stats, as I've been noting off and on for the past several months. 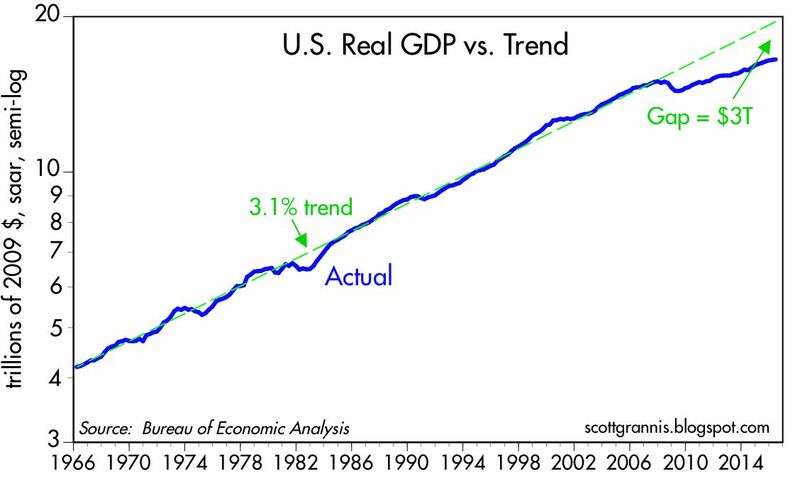 The economy is most likely still growing at a sub-par pace of 2% or so, as it has on average since 2009 (see chart above). 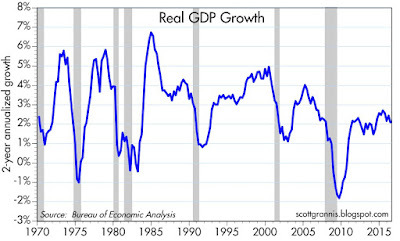 Just because it's growing slowly is no reason to worry that a recession is imminent. The analogy that says a slow-growing economy is like an airplane approaching stall speed is flawed. 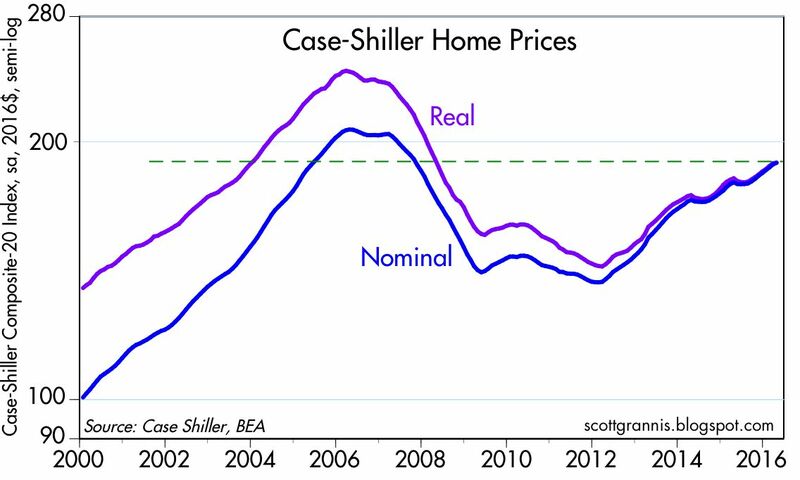 Indeed, recessions typically follow periods of excesses—soaring home prices, rising inflation, widespread optimism—rather than periods dominated by risk aversion such as we have today. Risk aversion can still be found in abundance: just look at the extremely low level of Treasury yields, and the lack of business investment despite strong corporate profits. If Donald Trump wants to win the election, his campaign ought to promote the facts to be found in the chart above. The economy's ability to grow by a little more than 3% per year on average for over four decades suddenly vanished beginning in 2009. For the first time in post-war history, the economy failed to recover to its former growth path following the 2008-09 recession, and it has managed to grow only 2.1% since then. Seven years of slow growth following a big recession have left the economy about $3 trillion smaller than it could have been. We're missing out on approximately $3 trillion per year in income, and that's yuuge. Put another way, the average family could have been earning about 18% more this year if the economy had recovered in typical fashion, and of course there would have been many more people working. The $3 trillion GDP shortfall is the easiest way to understand the widespread level of discontent in the U.S. today. As I noted some years ago, all the spending and borrowing that was supposed to "stimulate" the economy beginning in 2009 was essentially flushed down the toilet. Since 2009 we've conducted a laboratory experiment in the power of government spending and income redistribution to grow the economy by stimulating demand, and the result is proof that Keynesian theories are destructive, not stimulative. Neither government spending nor easy money has the power to create growth out of thin air, but politicians want to convince you that they do. The economy is weak today because we have wasted many trillions of dollars on transfer payments that only create perverse incentives to work less. One of the best things about the past two decades is the strength of corporate profits, as illustrated in the chart above. 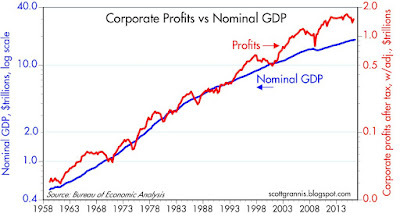 From 1958 through the mid-90s after-tax corporate profits averaged about 5% of GDP (note that the right y-axis, corporate profits, is 5% of the left y-axis, nominal GDP). But while corporations have generated about $1.5 trillion in after-tax profits on average over the past seven years (about $10.5 trillion in total), federal government debt held by the public (i.e., net borrowing) has increased by about $6.8 trillion. That means that, in effect, our government has borrowed 2 out of every 3 dollars of corporate profits for the past seven years, and then handed the money out to favored constituencies. In return, the government has enjoyed the lowest borrowing costs in history, but the economy has squandered much of its scarce resources. We've plowed two-thirds of the profits of the most valuable companies in the world into (mostly) transfer payments that have generated zero net growth. This recovery has seen a colossal waste of money. 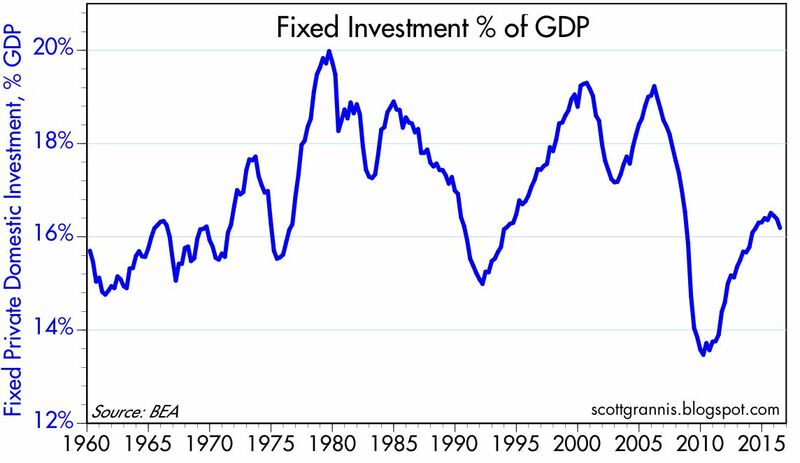 Another way to see this is to look at business investment, which has been miserable for many years. Businesses have been very profitable, but for whatever reason (e.g., the highest corporate tax rate in the developed world, which has discouraged businesses from repatriating trillions of dollars of overseas profits) they have been extraordinarily reluctant to reinvest those profits. 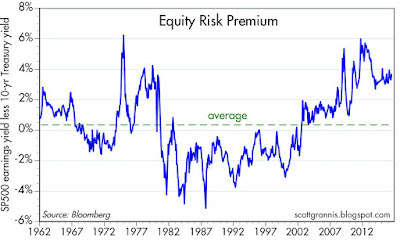 Call it risk aversion, or as I've deemed it, the reluctant recovery. 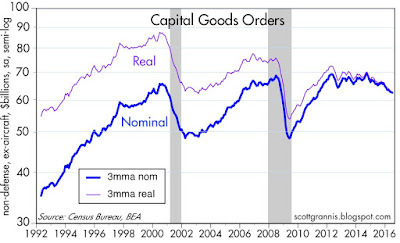 Capital goods orders (see chart above) are a good proxy for business investment. Capital goods are the things that make labor more productive. You can't grow the economy without investing in tools and technology that make workers more productive. 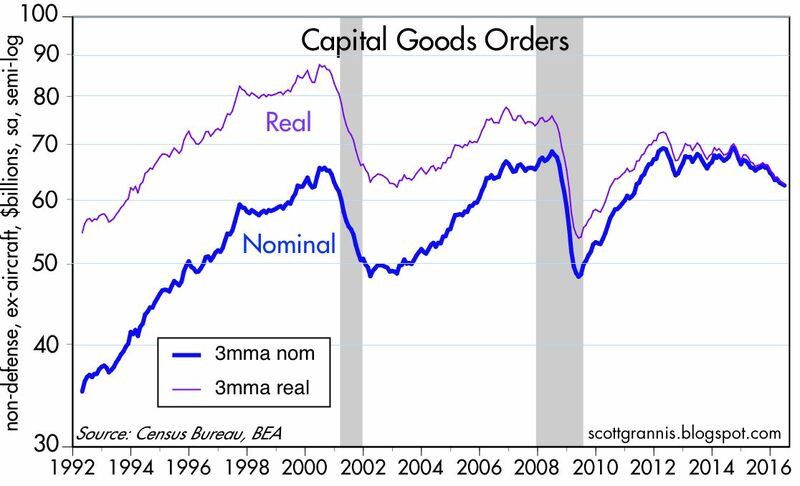 Lamentably, capital goods orders today are about the same as they were in the late 1990s. In real terms they have declined by 30%, even though the economy has grown by over one-third over the same period. Private Fixed Investment tells the same story. Relative to GDP, fixed investment (structures, equipment, and software that are used in the production of goods and service) has declined by almost 20% since 2000. The go-go growth of the mid-80s and the late 90s were driven by strong investment. 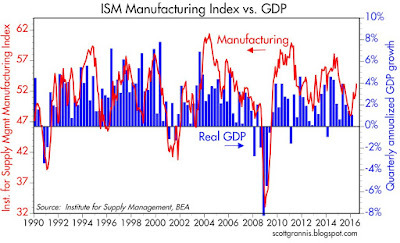 Today's weak investment climate has given us a miserably weak economy. It's not surprising. What is surprising is that so few seem to understand that the solution to our weak growth is to do things that encourage investment, work, and risk-taking. That includes not only lower taxes and reduced regulatory burdens but also greater confidence that conditions will remain favorable in the future. How many today are willing to bet huge sums that taxes will be lower and flatter across the board a year or two or three from now? It's almost impossible to know at this point, with the election still a toss-up between one candidate who vows to increase taxes and regulatory burdens and the other who would likely reduce them. I despise Donald Trump as a person (just as I despised Bill Clinton as a person), but I do think both Donald and Bill have a much better understanding of how business and the economy work than Hillary does. If Trump were able to push through a growth agenda, the rewards could more than make up for his failings in other areas. It remains a mystery why Hillary wants to double down on Obama's failed economic agenda when her husband's was so different and so much more successful. To judge from the rhetoric, the election is all about personalities: Hillary is a corrupt liar, Trump is a xenophobic, redneck egomaniac. The list of negatives is long for each. Instead it should be all about which one would be best for the economy. On that score, Trump should win hands down. The latest data from the housing market shows activity has been rather flat for the past year. 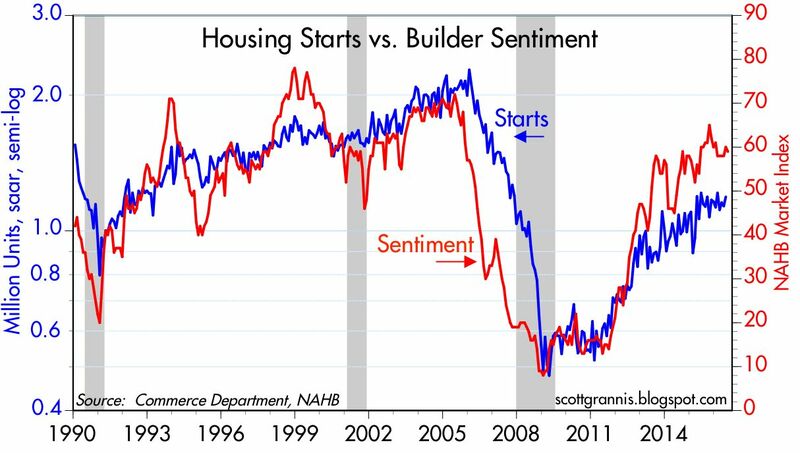 Starts are still significantly below what might be considered "normal," but builder sentiment suggests there is room for improvement. Indeed, starts would need to rise significantly over the next several years just to keep up with scrappage and the ongoing rise in housing formations and population. 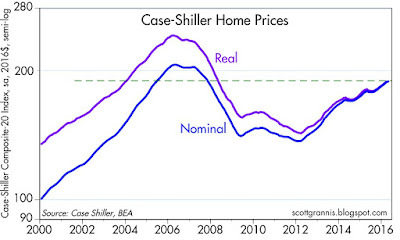 Housing prices, according to Case Shiller, are still well below their "bubble" highs in real terms. Meanwhile, mortgage rates are at historically low levels. Both suggest that there is lots of room for further growth. Both gold and industrial commodities have enjoyed a nice bounce since the end of last year. 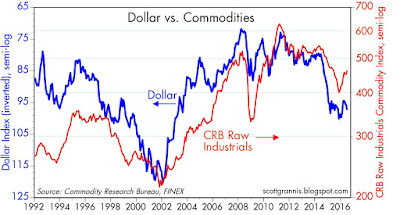 It's notable that the bounce in commodities has occurred even though the dollar has been relatively stable—usually it take dollar weakness to produce a healthy bounce in commodity prices. 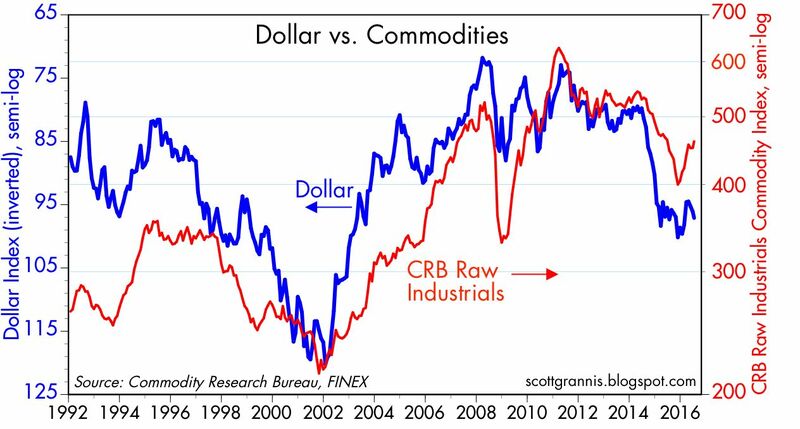 I'll chalk up the latest move in commodities to what appears to be a firming in global demand—a promising development given the doom and gloom which still pervades most markets (e.g., extremely low sovereign yields). 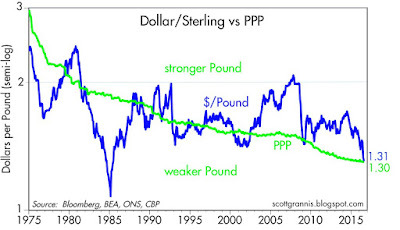 Sterling is the currency that has weakened the most of late, driven in large part by the perception that a "Brexit" will be a negative for the economy. I think it will work to the UK's advantage over time, but for now it just creates a lot of uncertainty. 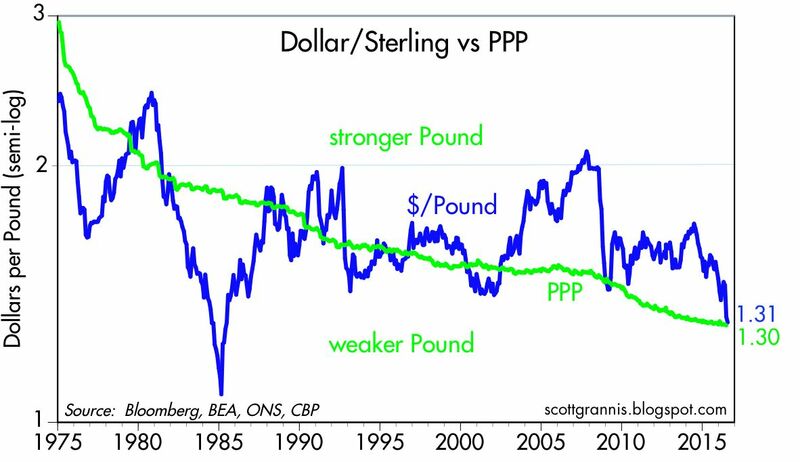 In any event, as the chart above shows, by my calculations the pound today is trading right around "fair value" vis a vis the dollar, after being quite strong for many years. If/when the UK adopts better trade agreements (freer trade), the pound has room to rise. But for now it's reasonably priced. Great time to take a vacation in the UK! 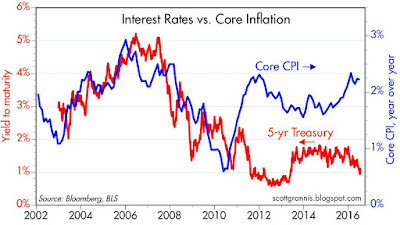 Beginning in early 2011, Treasury yields began diverging from core inflation. The significant gap between yields today and inflation is a sign, I believe, of a market that has very low expectations for economic growth and a great deal of risk aversion. As the second chart above shows, inflation expectations have declined by almost 100 bps since early 2011, but actual inflation has risen. This is a market that worries about slow growth and a Fed that is powerless to push inflation up. I think the market is underestimating the Fed's ability to deliver 2% inflation, since core inflation is already running above 2%, and it has been 2% or better for most of the past decade. 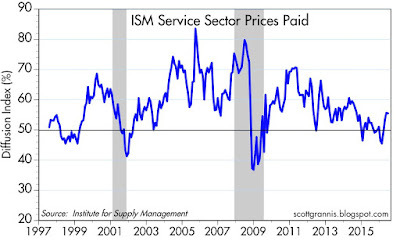 I fully expect the headline CPI to register at least 2% by the end of this year. Bonds are definitely expensive at these levels. 2-yr swaps spreads in the US have moved up a bit so far this year, but they are still in the comfort zone (15-35 bps) that is consistent with healthy, liquid markets and low systemic risk. 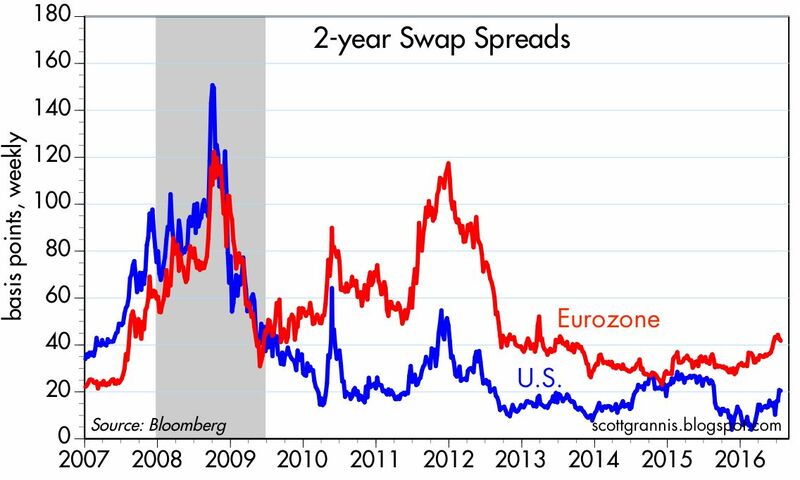 I note that the increase in swap spreads from almost zero to today's 21 bps has coincided with a stronger equity market. That makes sense if you consider that buying swap spreads (equivalent to buying AA-rated bank bonds) is a more attractive way to hedge against a weaker economy than buying Treasury bonds, due to the onerous capital requirements imposed on bank balance sheets (i.e., going long swap spreads doesn't consume capital the way going long Treasuries does). 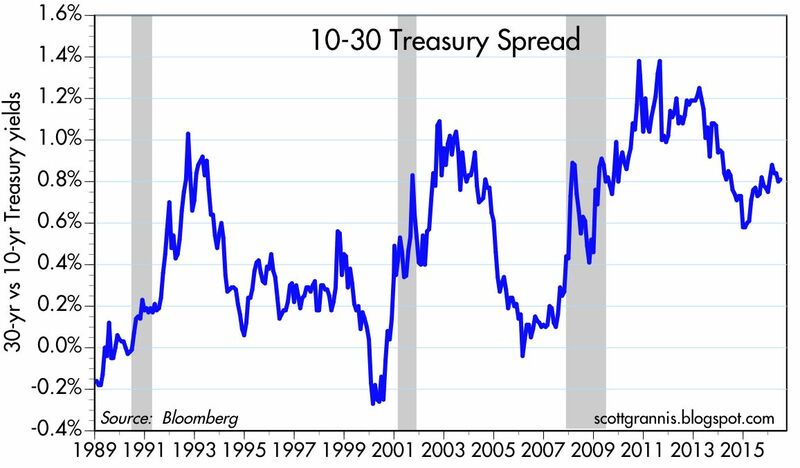 In other words, very low swap spreads were indicative of a market that was desperate for ways to hedge against a weaker economy. 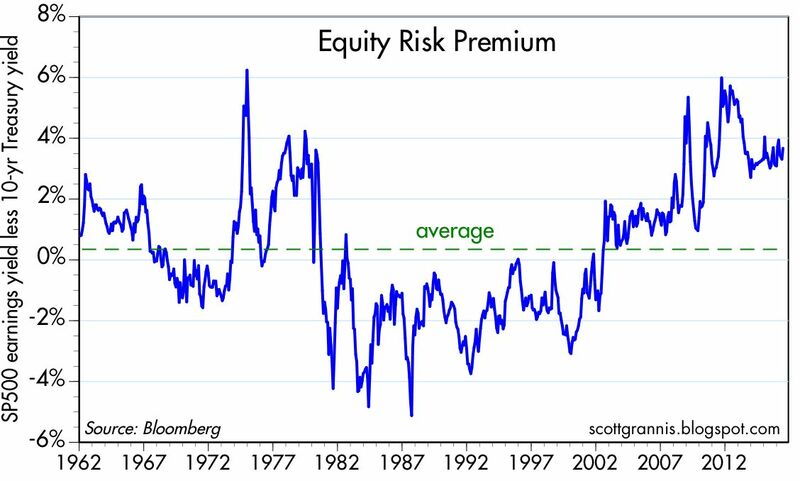 That swap spreads are more normal today means the market is less risk-averse, and we see that as well in rising equity prices. The chart above tells the same story. 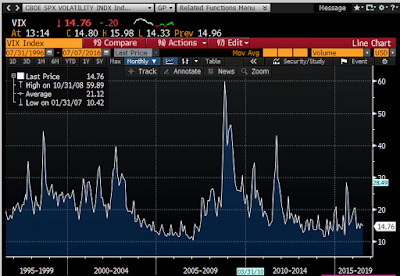 The ratio of the Vix index to the 10-yr Treasury yield is a measure of fear and pessimism. It has dropped in recent weeks as equity prices have risen. 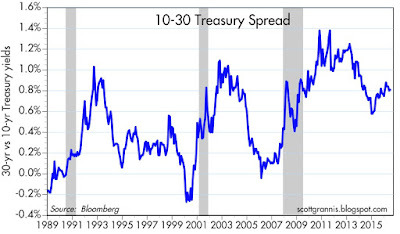 But the ratio remains elevated, thanks to extremely low Treasury yields. 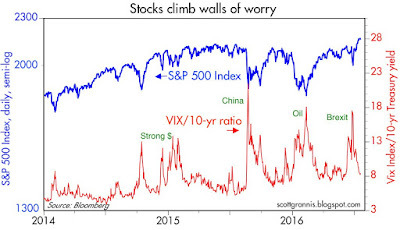 This means the market is less uncertain about the future, but not very optimistic about the prospects for growth (i.e., the Vix is relatively low and Treasury yields are extremely low). 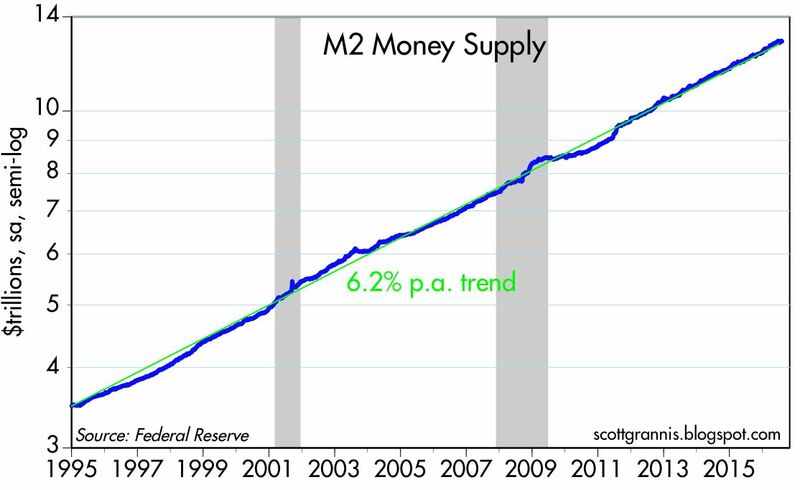 Arguably, the most significant macro development since 2008 is the huge increase in the world's demand for money, which is shown in the chart above. 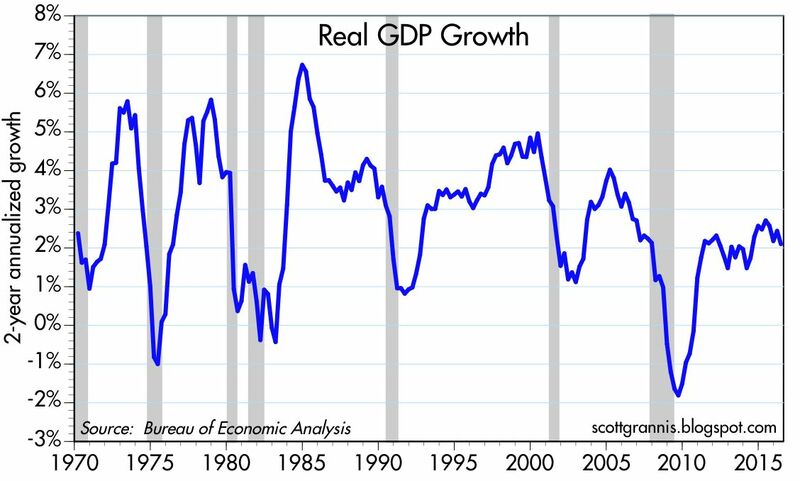 For decades the ratio of M2 to nominal GDP was relatively steady, but since 2008 it has soared to levels never seen before. This is indicative of a market that is still very risk averse, and it goes hand in hand with the significant deleveraging that has occurred in the private sector. Even though M2 has grown much more than nominal GDP since 2008, the growth rate of M2 has been consistent with historical trends, as the chart above shows. 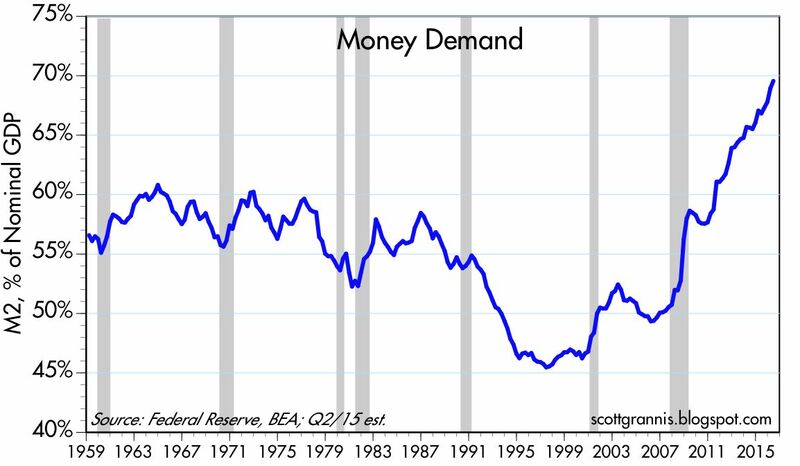 There is no evidence here that the Fed has "printed" money in excess of what has been the historical norm. 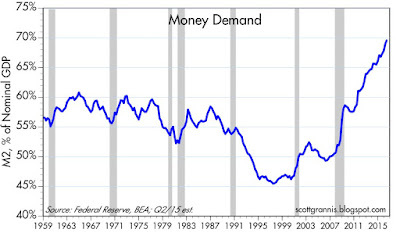 The Fed supplied more money to the system in response to a huge increase for the demand for money. There is nothing wrong with that! Without QE we would have been in a world of hurt: a shortage of money would have resulted in global deflation. 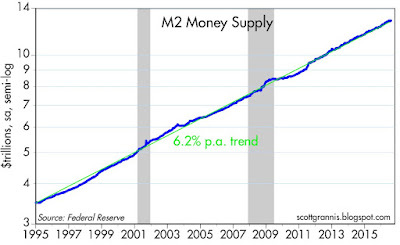 Bank savings deposits make up about two-thirds of the M2 measure of the money supply. 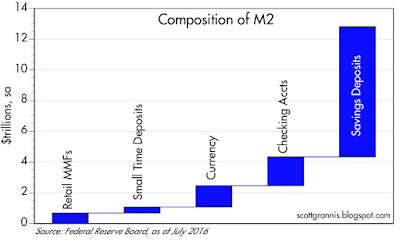 Virtually all of the growth in M2 since 2008 is accounted for by bank savings deposits, and banks have "invested" most of that money in bank reserves (banks have lent almost $3 trillion to the Fed since the start of QE). Banks have been quite risk averse, and they have also had to deal with onerous capital requirements (e.g., Dodd Frank and Basel Accords). It's certainly possible that most or all of the increase in bank reserves was driven by much more stringent capital requirements. 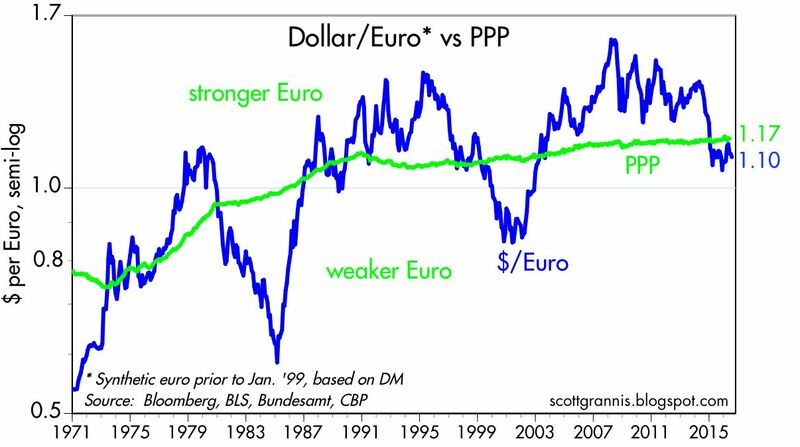 The euro has been relatively weak vis a vis the dollar since mid-2014, and Eurozone equities and Eurozone growth have significantly underperformed their US counterparts over that same period. 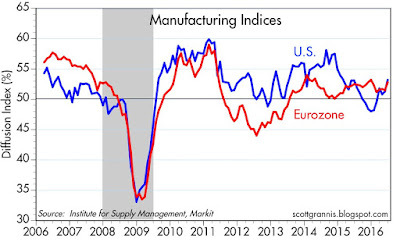 The US hasn't been very exciting of late, but the Eurozone has been even less so. By my calculations, the Euro is trading a bit on the cheap side vis a vis the dollar. It's hard to get excited about the Eurozone these days, and that helps explain why the Brits were so anxious to leave its embrace. I will be traveling tomorrow morning (headed up to Alaska for a week or so of cruising and sightseeing) when the June payroll numbers come out, but I have some observations that might help interpret whatever the number happens to be. To begin with, there is the issue of about 35K jobs that were lost in May due to a Verizon strike, and which will be added back in June since the strike was resolved. Then there is the issue of the significant undercounting of May jobs according to the BLS vs. what ADP reported. In the past, big swings in the BLS numbers that have not been confirmed by the ADP numbers have been reversed within a month or so. This leads me to think that the June BLS private sector jobs gain should be at the very least 200K, but that is more than the consensus (+160K). If its not at least 200K, then that means we have a slowdown on our hands. 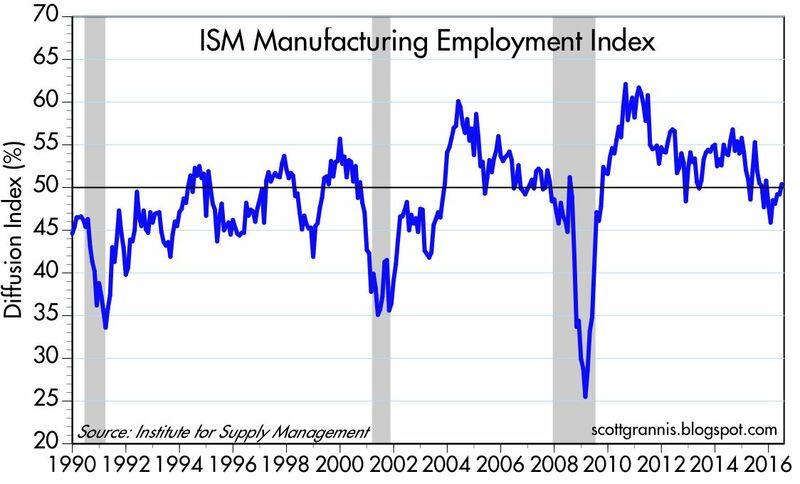 But the other data suggest no fundamental weakening of the jobs market, so for now I'm expecting an upside surprise that will only mean that nothing much has changed. 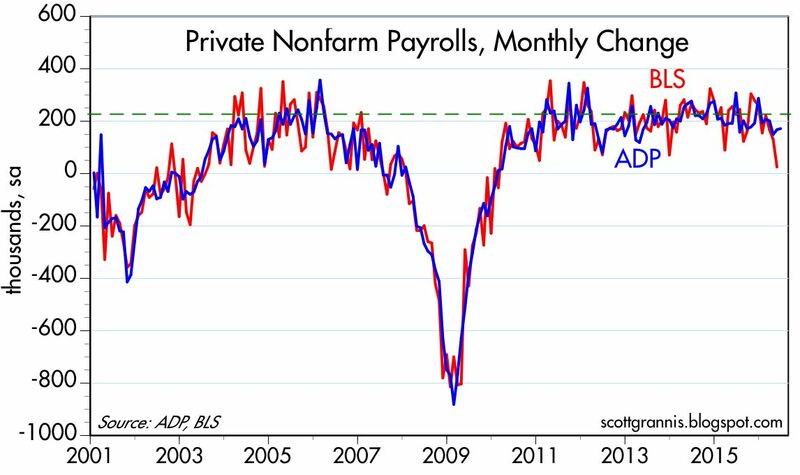 The red line in the chart above is going to have to jump significantly if the June ADP number is to be believed. 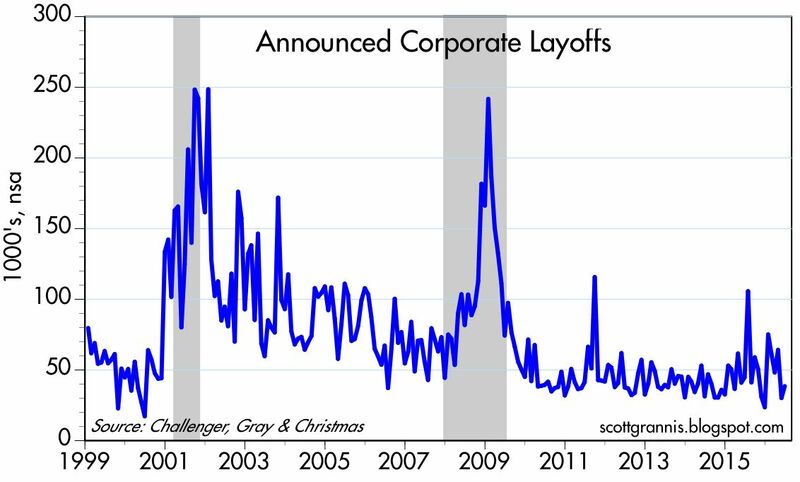 If it doesn't increase at least 200K, then the likelihood of a weakening in the jobs market rises, and that would not be good. 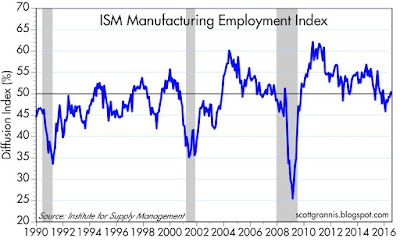 There is no indication of any fundamental deterioration in the labor market. 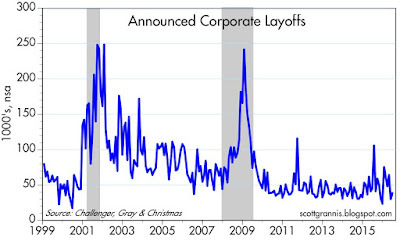 Large corporate layoffs are just not happening. 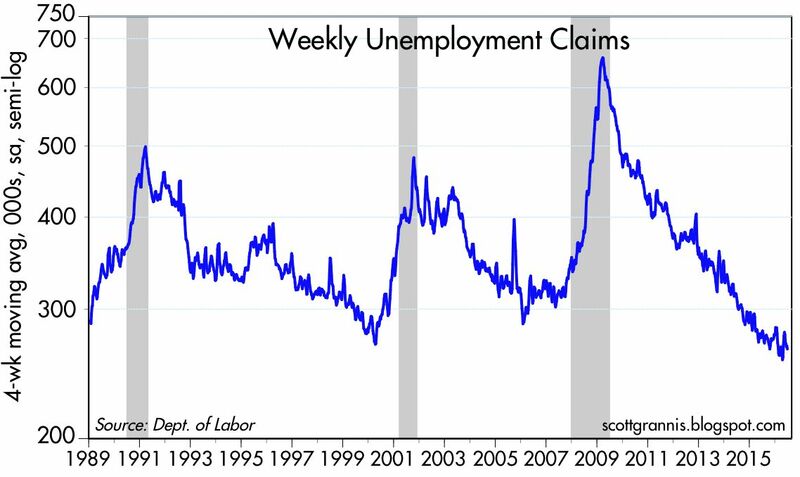 Weekly unemployment claims continue to trend down. 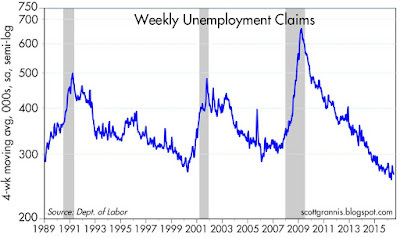 Based on claims, all looks quiet on the labor market front. 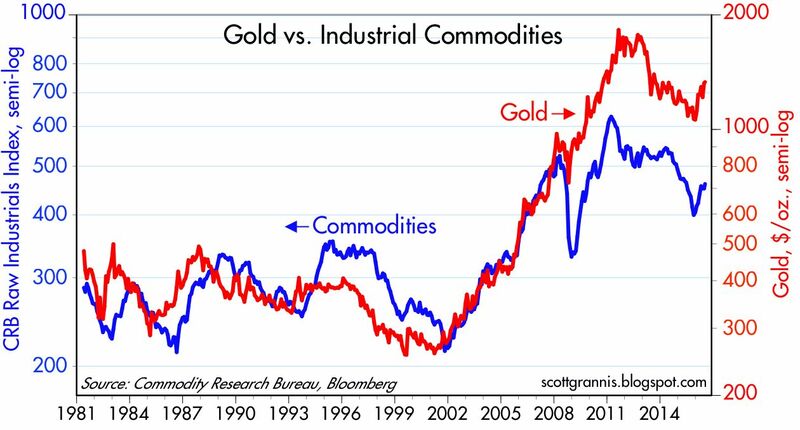 It's rare that the prices of two different asset classes should track each other over the years as well as TIPS and gold have. 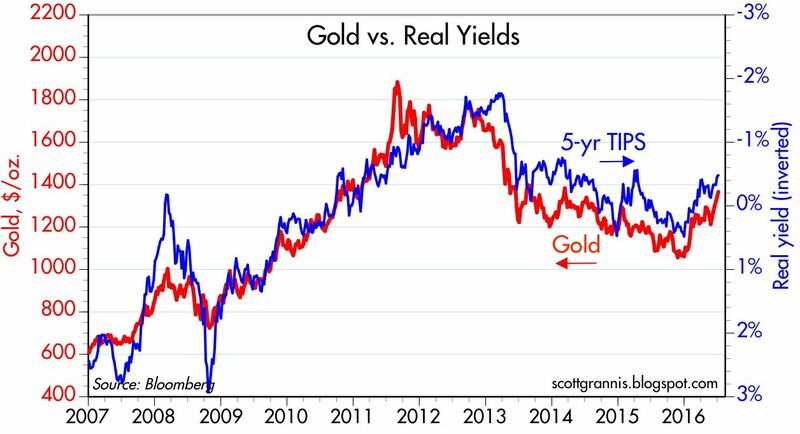 The chart above compares the price of 5-yr TIPS (using the inverse of their real yield as a proxy for their price, since bond prices move inversely to their yields) to the price of gold. For almost 10 years they have tracked each other reasonably well. What does this tell us? TIPS and gold share some qualities, but they are also very different. 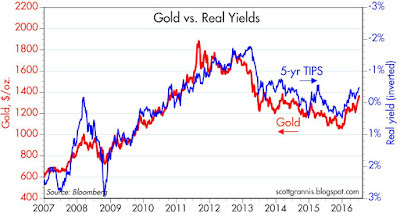 Gold is a physical asset, TIPS are a unique type of bond; gold pays no interest, while TIPS pay a rate of interest that is determined by the rate of inflation. Both are a type of "safe haven" asset—a port in a storm for investors worried about the future. TIPS are double-risk-free, since they are guaranteed by the US government and they pay a guaranteed real rate of interest if held to maturity. Gold is risk-free in the sense that it doesn't deteriorate over time. TIPS are a direct inflation hedge, since their nominal yield goes up and down in accordance with changes in the rate of inflation. Gold is an indirect inflation hedge, since it tends to maintain its purchasing power over long periods. Gold is also a traditional refuge from undefinable risk—the classic port in a storm, no matter what kind of storm. Changes in the price of TIPS can reflect changes in the demand for inflation protection; higher TIPS prices are sometimes—but not always—associated with rising inflation expectations. Changes in the price of TIPS can also reflect changes in the market's expectation for real growth (see chart above); TIPS pay a real rate of interest that ultimately is generated by the economy's capacity to grow. 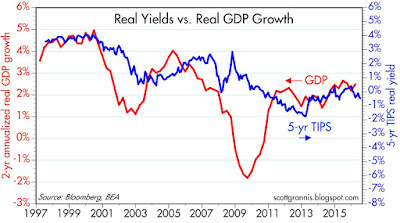 Since their introduction in 1997, the real yield on TIPS has tended to track the economy's real rate of growth. So TIPS can tell one of two stories, depending upon how the real yield on TIPS moves relative to the nominal yield on Treasuries of similar maturity. 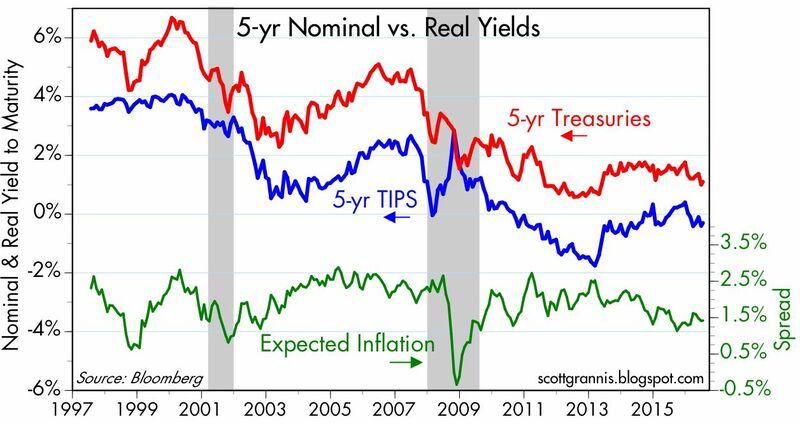 If nominal and real yields rise by the same amount, the message of TIPS is that the market is pricing in stronger growth expectations. 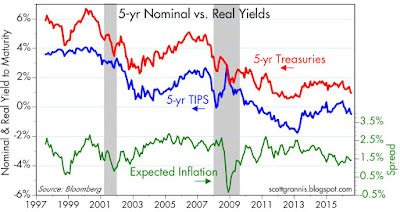 But if nominal and real yields diverge, then the message is that the market is pricing in changing inflation expectations. 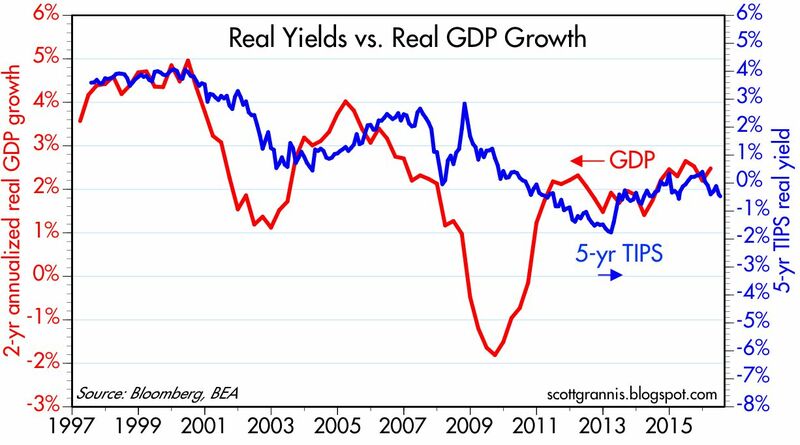 As the chart above shows, the recent decline in nominal and real yields has been roughly the same. Inflation expectations haven't changed on balance over the past six months. 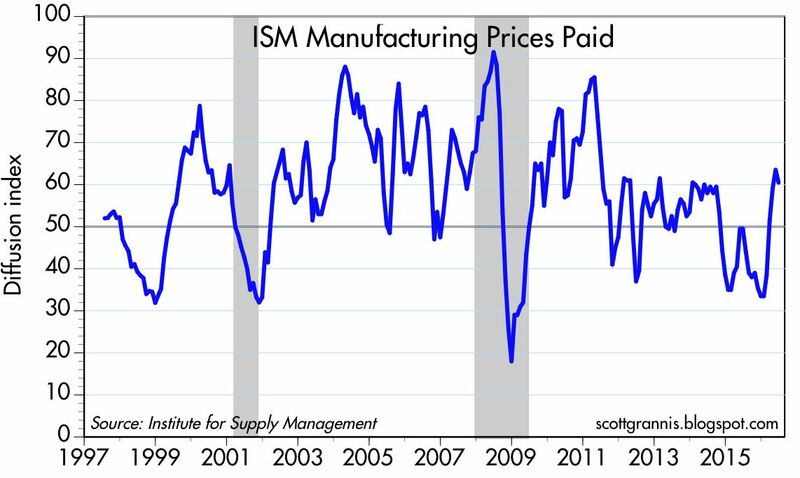 This tells us that the market is pricing in lower growth expectations. So: since gold prices have risen in line with TIPS prices, does that imply that gold is pricing in weaker growth expectations? That's possible, in the sense that weaker growth increases the likelihood of unpleasant policy surprises. Central banks might over-react to persistently weak growth by easing too much, which in turn would give us unexpectedly high inflation in the future. Politicians might over-react by passing "stimulus" legislation that has little or no ability to actually stimulate, but instead only weakens the economy and perhaps endangers certain sectors of the economy. Think higher taxes to fund more transfer payments, which only end up resulting in less investment. The rise in gold prices could thus be signaling that the economic outlook is becoming uncomfortably "clouded," and thus there is an increase in risk that cannot be hedged by traditional means. Enter gold. I don't have a definitive answer for all this, but it bears watching closely. At the very least the rise in TIPS and gold prices is telling us that the market is willing to pay a higher premium for protection because people are getting nervous. 10-yr Treasury yields at 1.38% tell us essentially the same thing: there's very little hope for growth, and a lot of concern that whatever happens it won't be stronger growth and could be worse. When the market is paying very high prices for a variety of traditional hedges, you know that people are nervous. 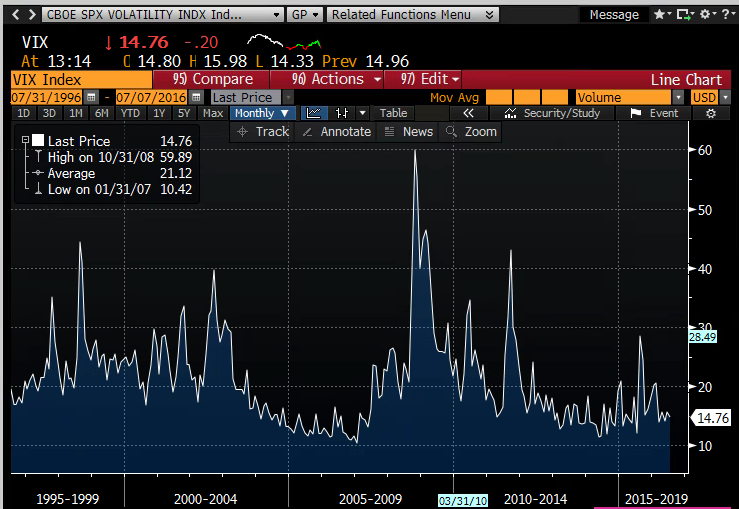 The only anomaly is the Vix index (see chart above), which is only modestly elevated. So the interpretation of all the data is not robust. The service sector of the U.S. economy accounts for about 70% of all jobs, while manufacturing payrolls account for about 9% and government about 15%. So the health of the service sector tells us a lot about the health of the overall economy. 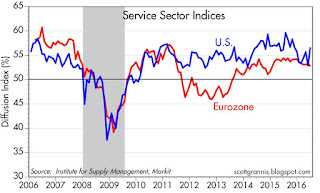 The latest news on the health of the service sector shows it is doing just fine, which is a good reason to think that the bond market is overly concerned about downside economic risks. 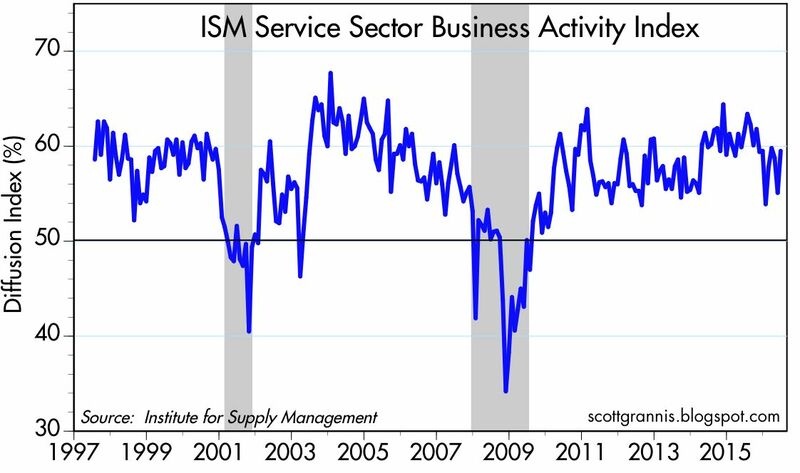 The Business Activity subindex of the IMS service sector report for June running is actually a bit higher than its 6-yr average. 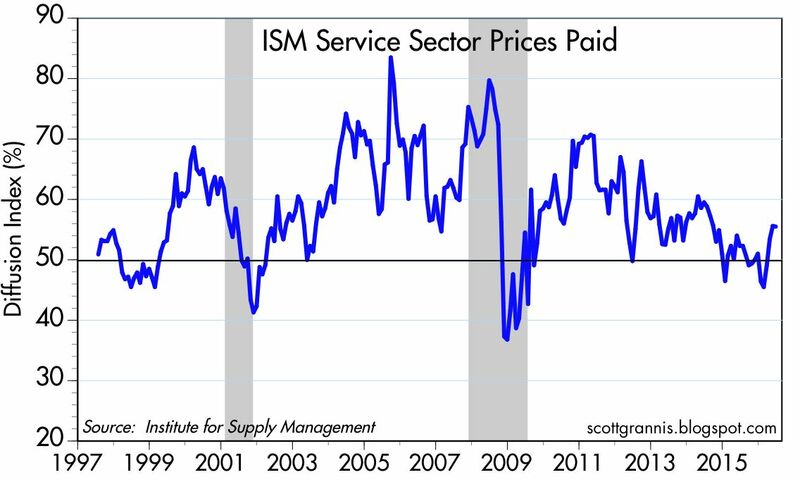 The Prices Paid subindex shows that deflationary pressures associated mainly with declining oil prices have substantially dissipated. 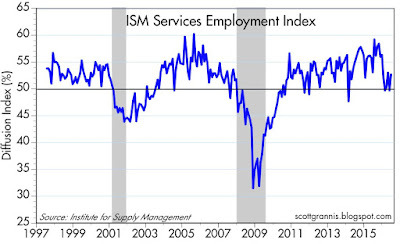 The Employment subindex is still positive, but not by much. This reflects a lack of business confidence in the future, and that in turn dovetails with the lack of business investment in general and the fact that this recovery has been the weakest on record. The overall Service Sector report for June was also a bit higher than its 6-yr average. 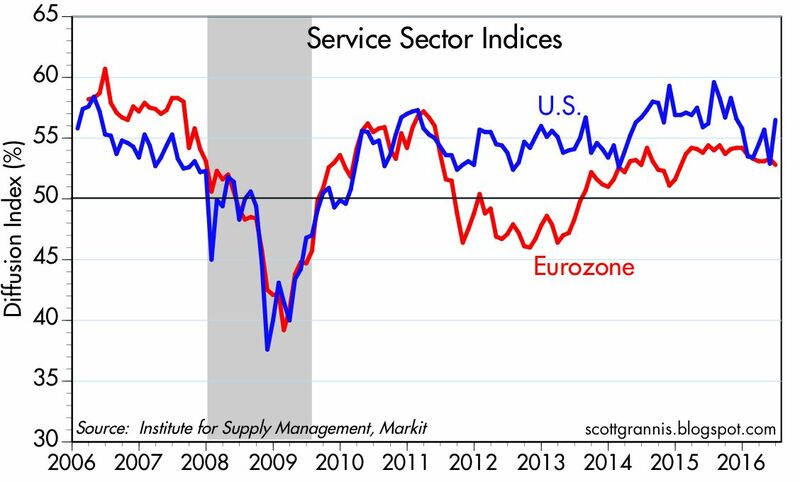 Conditions are not quite as healthy in the Eurozone, but their index is still comfortably in positive territory. Investors today worry about the implications of the fact that 10-yr Treasury yields fell to a new all-time low of 1.32% this morning. Does it mean the Fed is too tight? Does it reflect a threat of deflation? Is the global economy on the verge of another recession? Are we on the cusp of a exploding debt bubble? 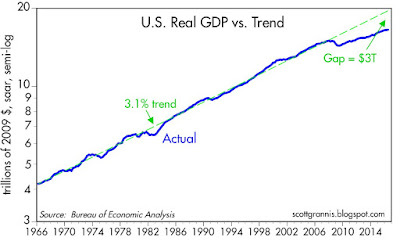 Will we never seen real growth exceed 2-3%? 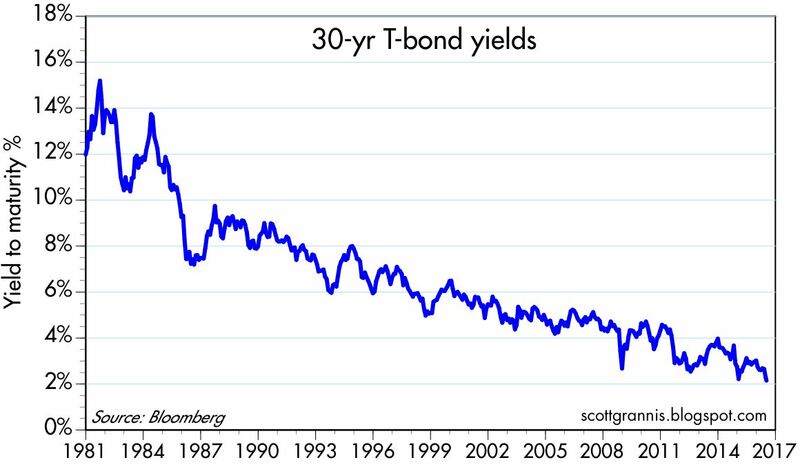 Are yields going to zero? 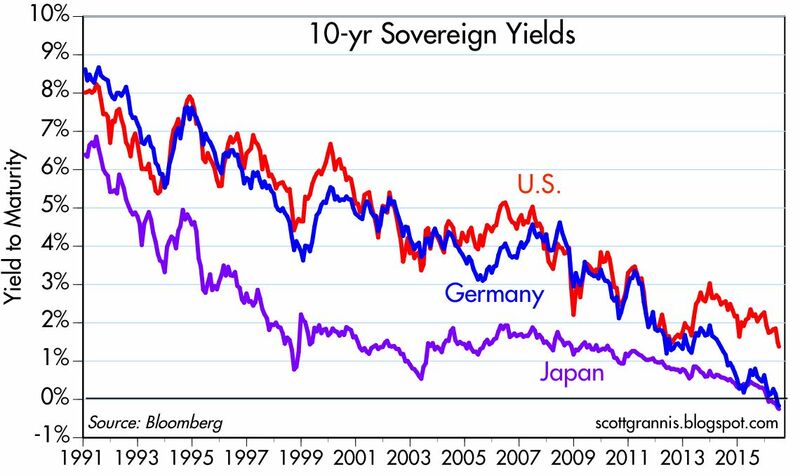 Will US yields follow German and Japanese yields into negative territory? If history is any guide, there's reason to cheer, not despair. The previous all-time low for 10-yr yields was 1.39%, recorded July 24, 2012. Investors who bought the 10-yr that day and still hold it have received a total return of about 5.7%. Investors who bought the S&P 500 that day and held on—shunning the widespread fears of global recession and deflation that plagued markets four years ago—received a total return of 54%. Gold and commodity prices fell some 15%. This should not be construed as a recommendation to put your life savings in stocks. It's merely to point out that the future doesn't always turn out to be as bad as the market expects. Sometimes it turns out to be much, much better, as has been the case for the past four years. 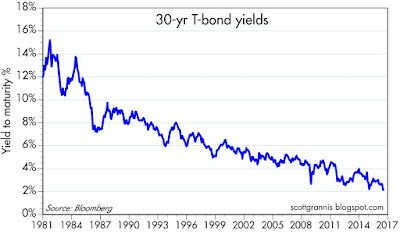 My best guess as to why yields are so low? It's simply that the market is very worried, and about a lot of things: quantitative easing, negative yields overseas, slowing growth, geopolitical tensions, bad fiscal policies, deflation, etc. 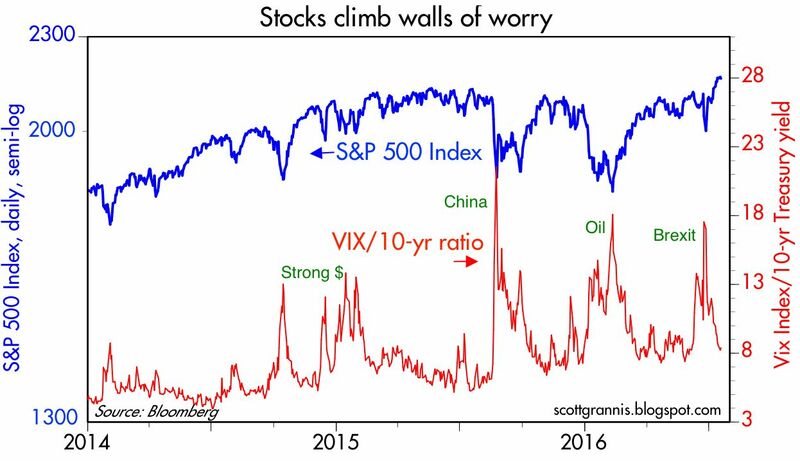 The market may be right to worry, but it may also be wrong. In order for an investment in 10-yr Treasuries today to beat alternative investments, an awful lot of bad things are going to have to happen over the next several years. In order to reverse the decline in yields, we'll need to see more optimism regarding economic growth and/or clear signs of rising inflation. Stronger growth, in turn, will require a return of confidence that would follow expectations of improved fiscal policy (e.g., lower tax rates, reduced regulatory burdens). The House under Speaker Ryan is moving in the right direction with budget reforms, but those won't pass as long as Obama has his veto pen and fails to grasp what is really needed to get the economy moving. As for inflation, we've seen a gradual rise in core inflation at the consumer level (2.2% year over year, and 2.4% annualized over the past six months), but broad-based inflation remains below 2%. The news is certainly mixed these days. Britain's Brexit vote stirs fears of a global slowdown in trade, which would surely be bad for the economic outlook. But that's still something out on the horizon. 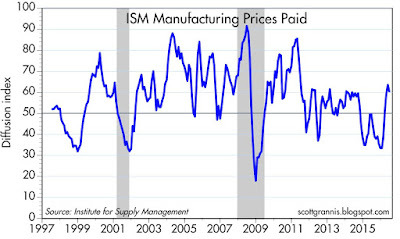 In the meantime, more recent data point to a pickup in growth that began a month or so ago. 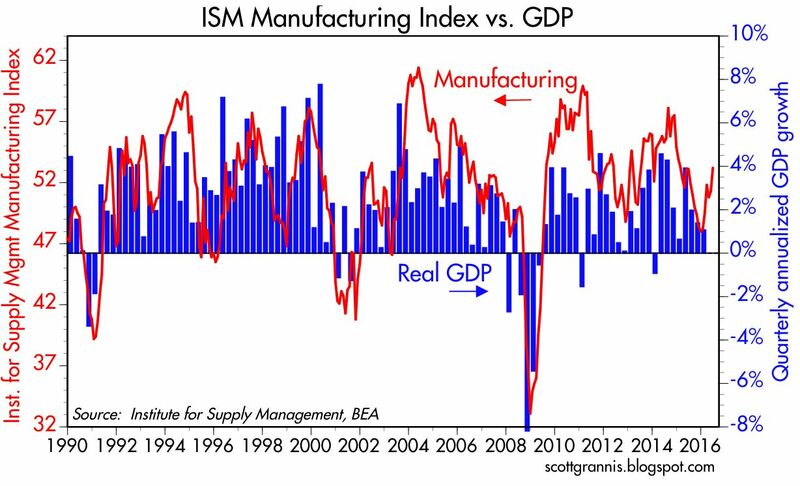 The ISM manufacturing index was stronger than expected (53.2 vs. 51.3), and as the chart above shows, this suggests that second quarter GDP growth will be stronger than the tepid 1.1% registered in the first quarter. It wouldn't be surprising to see Q2 growth come in at 3%. 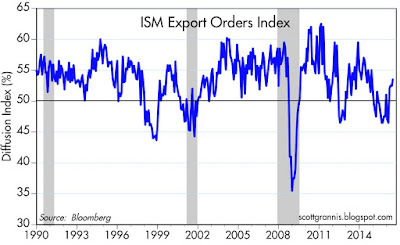 The export orders subindex continues to improve, which suggests that conditions overseas are improving. Now that oil prices have been rising for over four months, it's not surprising to see a clear majority of firms reporting higher prices paid. 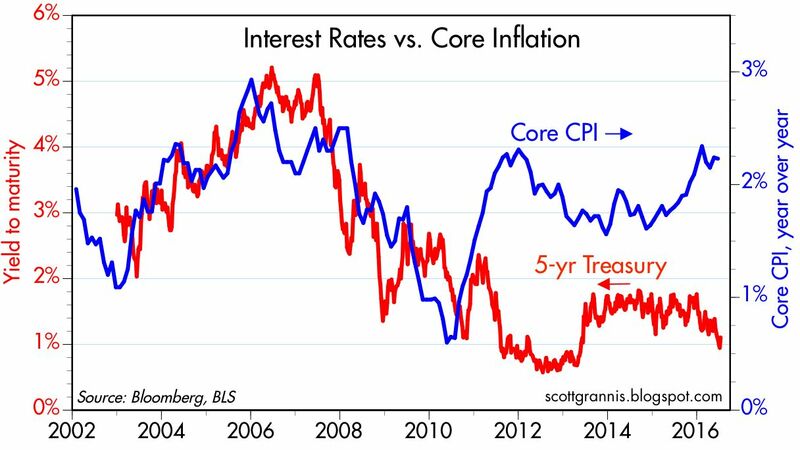 Once more we say goodbye to concerns about deflation. 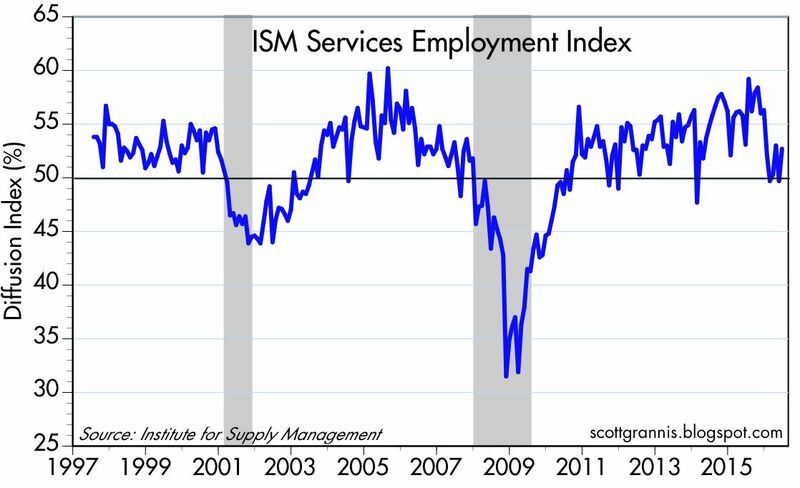 The employment subindex remains unimpressive, which suggests that firms are still cautious about the outlook. This recovery is still dominated by worries and risk aversion, but that's not necessarily bad. The time to worry is when everyone is optimistic. Manufacturing activity has been improving for the past few months in both the U.S. and the Eurozone. 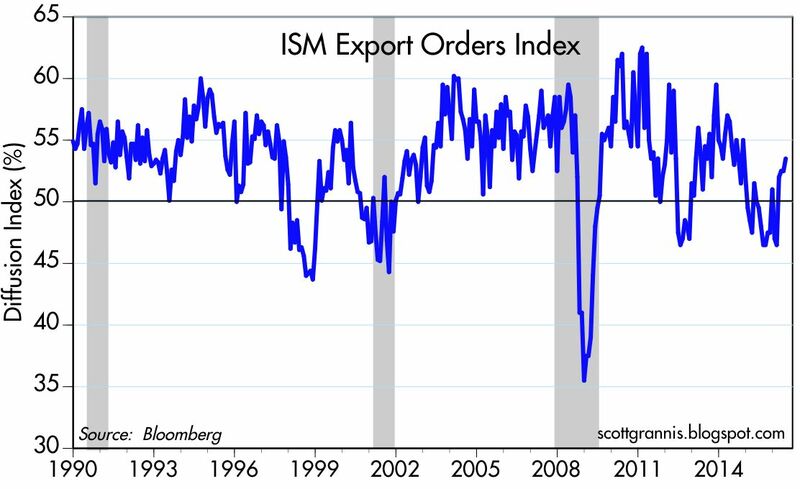 This may be tempered in months to come by the Brexit vote, so it's too early to get excited about a coordinated rebound in activity. But in the meantime it's reassuring. 10-yr Treasury yields are still amazingly low, closing today at 1.44%. 30-yr Treasury yields are also down to all-time lows, closing today at 2.23%. 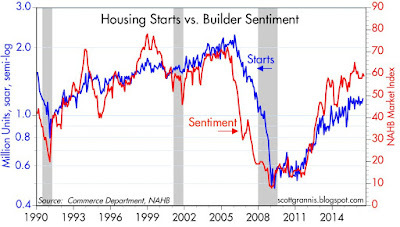 But the spread between the two, shown in the chart above, has been rising since last August. From a long-term historical perspective, the long end of the Treasury curve is plenty steep, and that suggests the market still expects the economy to improve over time. 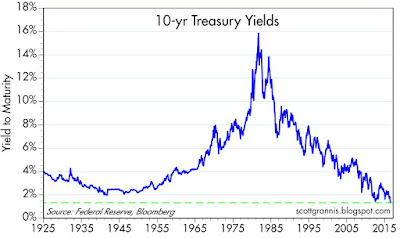 The time to worry is when the yield curve gets very flat or even negatively-sloped. 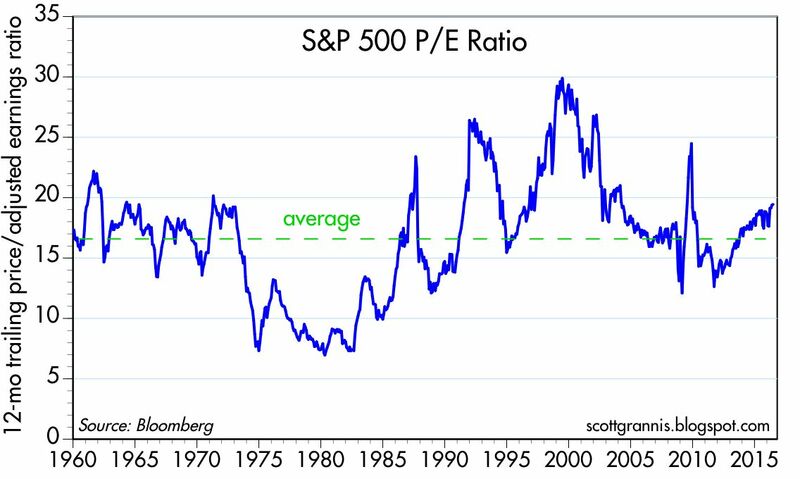 The PE ratio of the S&P 500 is about 15% above its long-term average, but this has to be viewed in the context of risk-free interest rates that are at their lowest level ever. 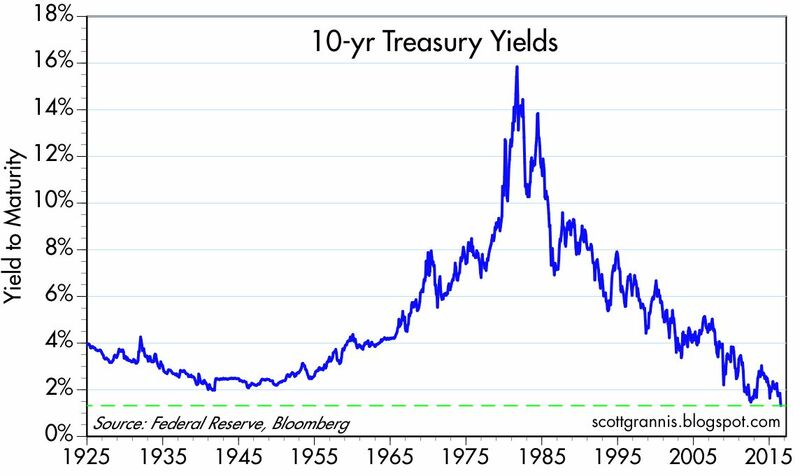 Put another way, the PE ratio of 10-yr Treasuries today is about 80, whereas the PE ratio of equities is about 20 (i.e., an investment of $80 in 10-yr Treasuries will get you an annual return of $1, whereas an investment of only $20 in equities promises a return of $1). 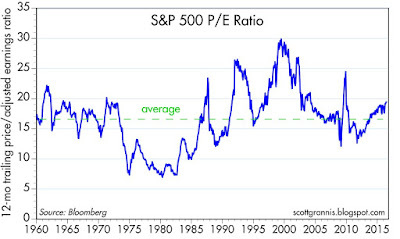 I'm thinking this is an unprecedented valuation gap in favor of equities. As the chart above shows, the earnings yield (after-tax profits per share divided by share price) on equities is still well above average. Moreover, EPS appears to be stabilizing, having fallen only 2.7% over the past year—and quite likely to increase now that the problems in the oil patch are in the past. If profits merely hold at current levels, the expected return on equities will be significantly higher than the return on Treasuries.